Jonathan Kozol, who has worked with teachers and children in inner-city schools for more than 40 years, is the author of such books as "The Shame of the Nation," "Savage Inequalities," and "Amazing Grace." His latest work, "Letters to a Young Teacher" (Crown, $19.95), adopts a gentler tone as it encourages young Francesca and all teachers who defy or confound what Kozol calls the "drill and kill" policies of the No Child Left Behind Act of 2001, or NCLB. The book coincides with the formation of Education Action!, a network of teachers, principals, and students created, in part, to oppose school vouchers and to support a constitutional amendment that would guarantee equal education as the right of every child in the nation. 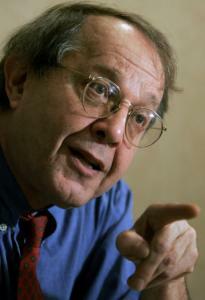 Kozol spoke from his home in Massachusetts. Q: Why were you fired from your first teaching job? A: I was a fourth-grade teacher in a deeply segregated school in Boston where nothing in the curriculum had anything to do with black children. So I picked up a copy of the collected poems of Langston Hughes. I hadn't heard of Langston Hughes at Harvard; I heard about him from the mother of one of my students. I read a few poems in class and later I was charged with "curriculum deviation." I was a white guy with a Harvard degree, so I didn't suffer. I went on to teach in the Newton public schools. But the children suffered. That experience radicalized me. Q: Before that, you weren't politically aware? A: No, I was a perfect product of Harvard College in the late 1950s. Q: How does Francesca, the young teacher in your book, negotiate her very different classroom? A: She survives because she is very good at what she does. I tell young teachers who are determined to dissent from some of the Draconian aspects of the current orthodoxy that the best form of protection is to be incredibly good at what you do and keep good discipline in class. In schools with a history of chaos, the teacher who can keep the classroom calm becomes virtually indispensable. Francesca was very well-prepared for every lesson and, at the end of the year, most of her children did well. There are hundreds of thousands like her; the problem is not to recruit them to our inner-city schools; the problem is to keep them. About 50 percent quit in three years, citing this testing mania and the distortion of curriculum thanks to No Child Left Behind. Q: How did Francesca confront that? A: She refused to drill her kids for tests; she refused to impose the proto-military routine that is prescribed for many minority children today, almost as if they were a different species. That kind of curriculum would never be permitted in a good suburban school. She gave them the same rich course of study she had received as a child - and she won the loyalty of their parents, to whom she gave her cellphone number. She was also fortunate in having a very enlightened principal who supported her. Q: Why do you see NCLB as destructive? A: NCLB widens the gap between the races more than any piece of educational legislation I've seen in 40 years. It denies inner-city kids the critical-thinking skills to interrogate reality. When they reach secondary school, they can't participate in class discussions. Only 4 percent of Chicago high school graduates complete four years of college. Ninety-six percent drop out because they've never learned to pose discerning questions. NCLB's fourth-grade gains aren't learning gains, they're testing gains. That's why they don't last. The law is a distraction from things that really count. There's nothing in it about class size. Children in the top suburban schools - Brookline, for instance - are in classes of 16 or 18 students. Inner-city schools often have 32 students in elementary school classes and up to 40 in high school classes. Q: Are class and race the most fundamental issues in your view? A: Our nation's oldest sin and deepest crime is the isolation of minority children - black children, in particular - in schools that are not only segregated but shamefully unequal. Instead of at least bringing equality to segregated schools, NCLB substitutes a regimen that kills the motivation of minority children, demands the impossible of inner-city principals, and drives away the most dynamic teachers, who end up in places such as Newton and Scarsdale. In this respect, race is still at the heart of my agenda. Q: How do you advise teachers to communicate? A: I encourage teachers to speak in their own voices. Don't use the gibberish of the standards writers. The official language of the state is loaded with bad English. You can't say use, you have to say utilize; you don't copy, you replicate; you don't start, you initiate; you don't just do it, you implement it. This comes from the world of mediocre semi-intellectuals who write state standards, who cover their insecurity by using polysyllables. All my work comes from a literary background and, at Harvard, I was blessed to spend two years as a disciple to Archibald MacLeish. He kind of adopted me. Like many young Harvard undergraduates, I became incredibly pretentious by my sophomore year. That's an illness not unique to the Ivy League but it is particularly prevalent in Harvard. MacLeish said that whenever you find yourself using big, fancy words in order to convey a term that can be conveyed in simple words, be suspicious of your motives. Good advice. Anna Mundow, a freelance journalist living in Central Massachusetts, is a correspondent for the Irish Times. She can be reached at ama1668@hot mail.com.